If you want to browse the internet privately, there is an option “Start Private Browsing”. But might not be from them who likes to use that feature every time when starting Firefox. Then you should clear the browsing history, cache and cookie regularly with some intervals of time to enjoy better browsing of the Internet. Here is how to clear your browsing elements in Firefox 4. 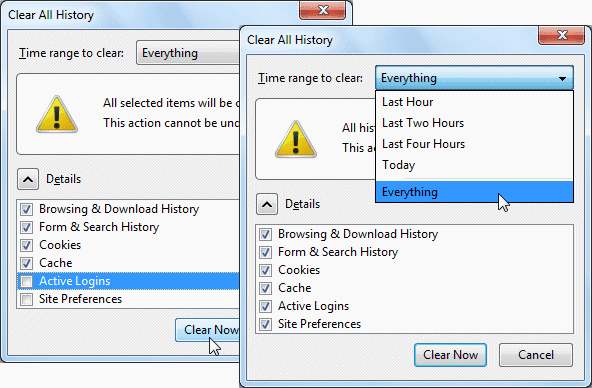 Step 1: To clear the browsing history manually, click on History > Clear Recent History from the Firefox menu button. 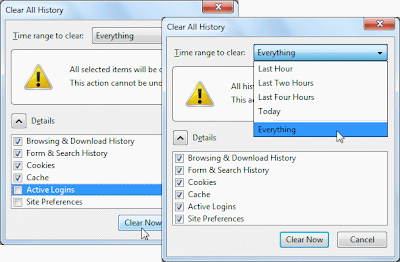 Step 2: Clicking on the Clear recent History item takes you into the Clear All History dialog box which comes up with several choices. You can decide the time range as well as the type of the element to clear. So, firstly select the time range to clear from the drop down menu. It comes with the options of deleting the data from last one to four hours. There is another option called as Everything, which lets you to clear all the data since this time. After you choose the time range, select the type of element that you want to clear. UnderDetails, check the types you want to delete. Checking Browsing and Downloads to clear will delete all the previous browsing and downloading data. Similarly, you can chose to delete any element by checking the boxes beside them from the list . Once you are done with your selections, simply click on the Clear Now button. You can also set Firefox so that it clears the browser cache automatically. Click on Options > Options from the Firefox menu button. Alternatively, you can go to the options from the Tools menu. In case, if you hide the Toolbar from Firefox, you can bring it back by pressing the Alt key from the keyboard. Then click onTools > Options. In the Options window, head to the Privacy option and there you have some options to manage the browsing history. You can choose it not to remember the history for ever and clear the data every time you close Firefox. If you do not want Firefox to remember anything, Check the “Permanent Private Browsing Mode” box. You can also select the expiration range of the cookie. Select the duration to keep the cookie from the drop-down menu. While this article is on a simple guide to manage the browsing history in Firefox 4.0, we will be discussing more with other settings. Stay tuned with us.